Pentacles represent coin, or money – and tangible things of the physical world. On the Four of Coins, we see a person clinging to one coin with both hands, pinning a coin under each foot, and even balancing one on his head. The phrase “penny pinching” comes to mind! This is a card of financial struggle, of not wanting to part with the few coins that are in posession. The fours generally represent a solid foundation and plenty of room to work with – but, inverted, could mean just the opposite. In the case of Four of Coins inverted, I’m inclined to say that the financial foundation needs fortified – and that there may be feelings of being bound or confined by the current financial status. Beginning a garden; adding on to a building; purchasing property; home and property renovations; setting down roots of a project; prosperity; stability; working toward ambitions. Spend time with a 2-year-old, and you will soon hear the sounds of the Four of Pentacles: “No!” and Mine!” These are the cries of the ego, which is just developing in the young child. The ego tries to guarantee power by imposing its will. The desire for control is the hallmark of the Four of Pentacles. Some control is valuable. In chaotic situations, a firm hand is needed to provide structure and organization. Too often, however, the urge for control gets out of hand, stifling creativity and individual expression. In readings, this card asks you to weigh carefully the level of control in your situation. 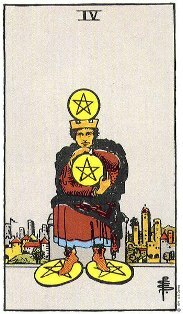 The Four of Pentacles can stand for issues of ownership. You may be involved in getting and keeping money or some other commodity. You may be having problems with possessiveness or jealousy. Use the energy of this card to preserve and defend, but not to lay claim. People need to be free to determine their own lives. 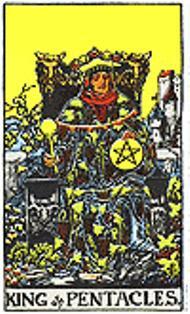 The Four of Pentacles also implies blocked change. It’s as if the stubborn little man on the card is thwarting your every move. Opposition may come from those who want to maintain the status quo. It may also come from within yourself. Are you resisting change that is truly needed? We often cling to the familiar even when we know it’s not for the best. A man holds tight to his four pentacles in this card. And in this case, the refusal to budge may be damaging. This is the miser card. Remember how the Querent got more work, money, luck, health in the last card, the Three of Pentacles? Well, he’s holding on tight to what he’s got, not sharing it with anyone, not investing it in the future, just holding onto it, trying to keep it still and unchanging. When this card appears it tells the Querent that they’re in a position of status, health, money, even comfort. Solid, and unchanging. But the Querent is too afraid of losing all this. Notes: These definitions are for the card in its upright position. I think it’s interesting that the first defiinition speaks of moving or renovating – the past three months were packed solid with hopes and dreams and plans to move – and the Universe decided we be best to stay put right where we are. It wasn’t me resisting change – it was change resisting me! *grins* As for renovations, this house needs them badly – but I’m not in a financial position to even think about that at the moment. The other definitions speak of control, of which I feel I have none at the moment, nor am I struggling to obtain it. On the contrary, I realize that the more I try to control a situation, the less control I have over it. Normally, I try to at least have an edge on it – by way of Daily Dose, or by engaging in or enhancing certain energies and/or influences in my life. Yet recently, I’ve been on complete shut down – rolling with the punches, so to speak. Maybe, then, it means its time for me to regain control? As for holding on to what’s had, that’s comical. The account is currently overdrawn. Yesterday was my first day back at work. It was a fair day financially, and yet, I wake this morning without a dollar in my wallet – and an overdrawn bank account. I put just enough gas in the Jeep to take the kids to the store last night and to get back to work this morning. Took the kids to the store to buy the basis and mandatory school supplies, a box of cereal, a gallon of milk, and some juice. Just enough to get them through ’til Friday, when I can spend everything I earn today on just enough to get them through the weekend. Obviously, there is no “holding” anything… it comes, it goes – and sometimes, like right now, it’s gone before it ever gets here. The trick is to not freak out. I was in a fairly decent position before I missed that week of work. Had I not missed the week, I’d not be overdrawn and we’d have what we need. Now, I need to work extra hard to try to catch up. I hit the nail on the head in my own definition when I said “penny pinching”, which was the exact phrase that came up in the definition from LearnTarot. And, the definition I offered up before referencing sources seems most fitting to my current situation. Financially tapped and strapped. That’s the moral of this story.